This comprehensive text takes students through the necessary fundamentals of field experience. It helps students understand the supervision process and their place in the agency. Vital topics such as ethics and HIPPA, multicultural issues, tape analysis, and multiple approaches to supervision are included. This text uses the Microskills approach as part of the overall field experience. The authors fully prepare students for more advanced or challenging scenarios they are likely to face as helping professionals. How, for example, do students 'manage up' to their agency supervisors as part of their growth process? And, how do they effectively supervise their peers? Taking a very practical, student-friendly, and holistic approach, this book addresses these needed skills. By reading this book, beginning students in internships and practicum will have a good sense of what actually goes on in an agency or school. Dr. Lori Russell-Chapin was the chair of the graduate counseling program for 11 years at Bradley University in Peoria, Illinois. She is currently the Associate Dean of the College of Education and Health Sciences at Bradley and the co-director of the Center for Collaborative Brain Research. She continues to teach practicum and internship, crisis intervention, introduction to the profession, and neurofeedback and ethics courses. Dr. Russell-Chapin works in private practice with her husband, Ted, and has been a clinical supervisor for many years. She is a Licensed Clinical Professional Counselor, a NBCC Approved Clinical Supervisor and a Certified Clinical Mental Health Counselor. 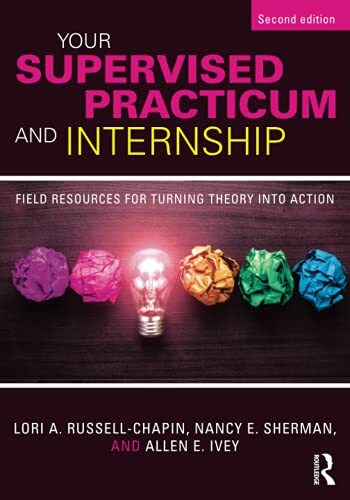 An award-winning teacher at Bradley with numerous articles in peer-reviewed journals, books, and creative productions, Dr. Russell-Chapin and Dr. Allen Ivey are the co-authors of Your Supervised Practicum and Internship: Field Resources for Turning Theory into Practice. "I would describe this manuscript as a comprehensive and well-written guide for field experience students as they attempt to integrate theory and practice. It offers a range of practical case studies; a review of microcounseling skills and their application to clients; considers a variety of supervision relationships bases upon counseling specialty and work setting; offers numerous... forms and practical reflection exercises; and covers a variety of multicultural issues of which the field experience student should be cognizant. This text fills a gap in the training curriculum and offers a comprehensive integrative resource for interns in a variety of ...settings." "This book presents a very useful method for learning and strengthening counseling skills; the material on supervision is very useful for students who do not know what to expect or how they will be treated in an agency; and the good develops a variety of issues that are important to students new to the counseling setting." "I feel this text has more practical exercises for students to work through...I feel that it would make an excellent guide and resource workbook for practicum and internship students." Russell-Chapin, Lori Ann; Ivey, Allen E.
5. 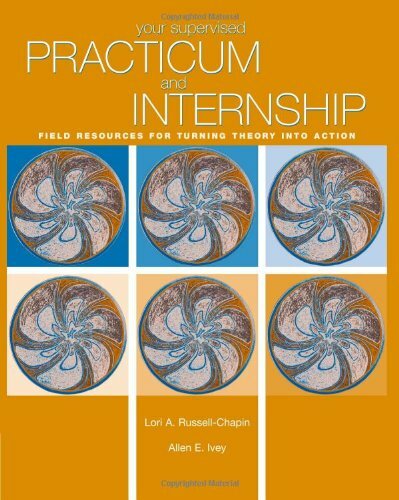 Your Supervised Practicum And Internship: Field Resources For Turning Theory Into Action (Practicum / Internship) Russell-Chapin, Lori Ann and Ivey, Allen E.